Challenge Winners Announced in an article I wrote for the Association of Medical Illustrators Newsletter– summer 2013.
hundred nanometres… it is precisely here that our understanding remains the most patchy. In this molecular world of alien-looking shapes and bizarre physics, Human Immunodeficiency Virus (HIV) attacks critical immune system defense cells in human blood to cause the disease AIDS. The AIDS pandemic has taken over 33,000,000 lives and adds millions more each year. Despite technological advances, researchers cannot yet "see" a mature HIV virus in its native environment with atomic detail, but they can assemble known atomic pieces together to construct models of the virus in vivo. Recent developments in our new software autoPack have simplified much of this process and here we present a first-draft model of an HIV particle floating in a cube of human blood plasma. This HIV particle measures 0.000000120 meters in diameter which is roughly 1/60 the diameter of the white blood cells that HIV attacks. Blood plasma at this scale consists of "salty" water (not shown) filled with blood plasma proteins that take up ~6% of the blood plasma volume. When you zoom in to a point that you can see individual atoms, the proteins that make your blood plasma viscous look like large blobs surrounding the massive HIV particle. Contestants will explore a 3D version of this 2D watercolor painting created by David Goodsell that depicts a Human Immunodeficiency Virus (HIV shown here in pink) in a cubic volume of blood plasma in molecular detail. This model will be created by scientist-artists Graham Johnson, Ludovic Autin and David Goodsell using the software cellPack (a specialized biological version of autoPackl) developed by Graham Johnson PhD from University of California San Francisco (UCSF) and Scripps together with Ludovic Autin PhD, Mostafa Al-Alusi, David Goodsell PhD, and Michel Sanner PhD in Art Olson PhD's molecular graphics lab at the Scripps Research Institute. 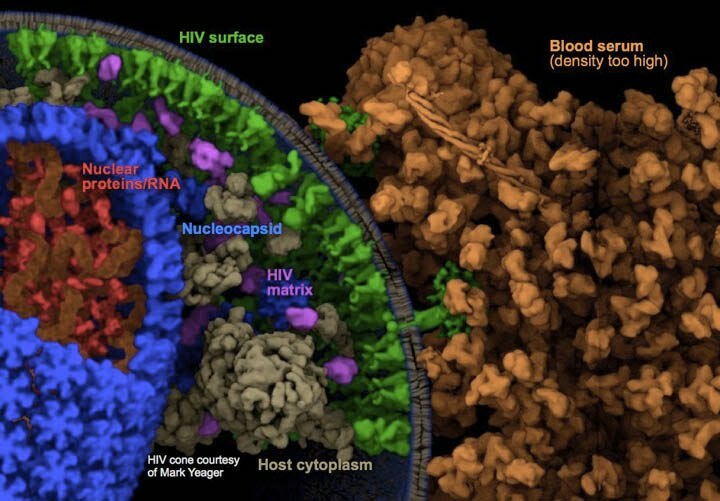 An early version of the autoPack version of this model from 2011 is shown here with the blood plasma proteins color-coded orange, the surface proteins of HIV shown in green, HIV cytoplasm shown in purples, human cytoplasm that gets pulled in to the HIV capsid during formation shown in beige, the nuclecapsid proteins shown in blue, and the nuclear proteins and RNA shown in orange. This image, rendered quickly in Cinema4D shows just 1 octant of the HIV viral sphere and a small portion of blood protein, but the final model will contain a full spherical virus with at least 1 viral diameter of blood plasma in ever direction to form a cube ~3HIVunits/side. The blood plasma proteins (orange) in this outdated cellPack model are 2x more dense than they should/will be in the final, so there is plenty of room to see glimpses of the HIV particle through the blood or to navigate cameras/ships through the blood, etc. We will ultimately provide the most accurate model possible, and we will have scientists working to improve the model as the contest goes on, so contestants can choose to update to the latest and greatest if they have a scene that is rigged, rather than key framed to allow such flexible swapping (they will not be judged on whether or not they update). AutoPack itself solves an object packing problem that has plagued 3D modeling and engineering for decades, so contest participants will find other uses for it straight away (e.g. packing objects into a box or people onto a surface with no overlaps–see autoPack website), but we feel that the contest can also help 3D artists contribute to visualization problems (such as "how do we get audiences or researchers themselves to notice any specific critical details when confronted with a modern biological data set on the scale of HIV-in-BloodPlasma?"). In this manner, cellPack specifically can help merge art and science to solve scientific problems and to engage otherwise disinterested public audiences, by allowing artists and researchers to work together to contribute their own unique expertise towards a common goal(s). You can see that this HIV-in-BloodPlasma model is complex, both visually and computationally. Navigate the asteroid field of the plasma proteins en route to the HIV death star. Explore the messy and mysterious realm of Blood Plasma and the viral surface in the style of film maker Jacques Cousteau.